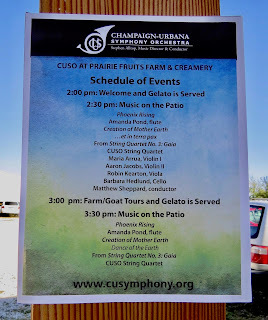 On Sunday, Sept. 23rd, the Champaign-Urbana Symphony Orchestra (where I am Composer-in-Residence) and Prairie Fruits Farm & Creamery co-sponsored a Gelato Social. It was, quite literally, picture perfect! We had blue skies above us, a modestly warm temperature with a gentle breeze… with homemade gelato, live music, and cute goats, who could ask for more? Our event got underway at 2 PM with Leslie Cooperband, co-owner of PFFC, scooping up fresh gelato for our guests. As PFFC makes all of their own gelato, we were treated to a range of intriguing flavors including salted caramel, honey lavender (harvested from their own garden), and a delicious pear sorbetto (harvested from their orchard). 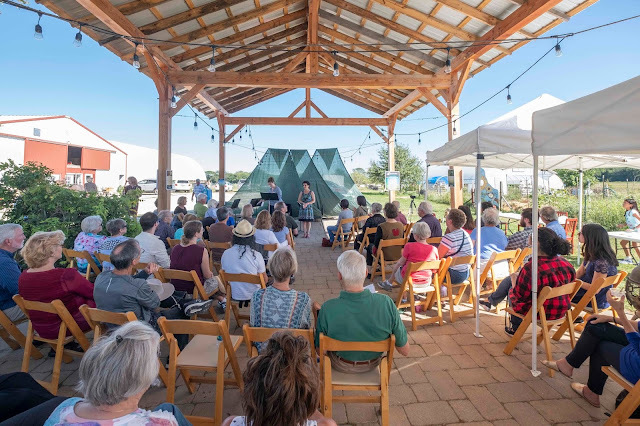 People wandered around the farm for a bit, visiting with the goats and admiring the herb and flower gardens, before finding seats in the pavilion for our 2:30 PM performance. We had about 80 people in the audience, but you’d never have known it – they were serenely quiet throughout the event. CUSO’s 2018-2019 theme is “Our World, Our Music,” and the music I chose for the Gelato Social fits perfectly with this earth-inspired theme. 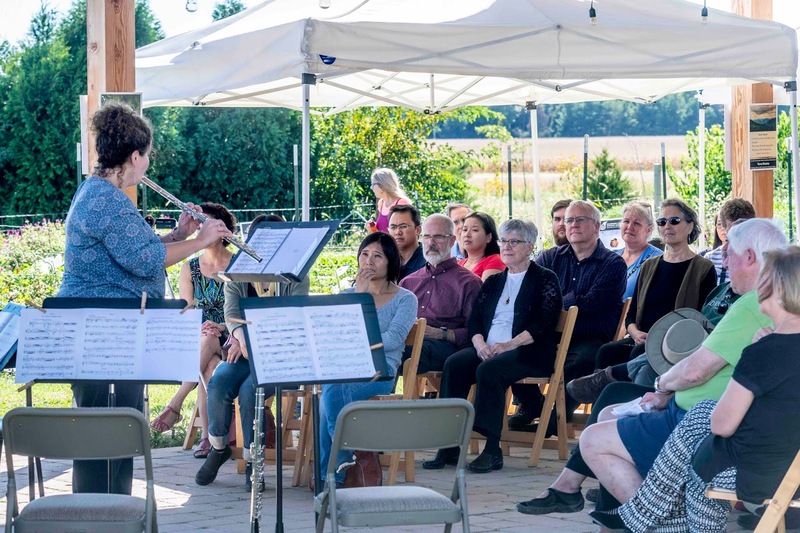 CUSO flutist Amanda Pond began the concert with my Phoenix Rising, which tells the tale of the old phoenix who perishes on a bed of flames and bursts forth as a young, spry phoenix. This story of rebirth, and renewal was an apt piece to tell in the middle of lush farmland that seasonally goes through its own process of renewal. 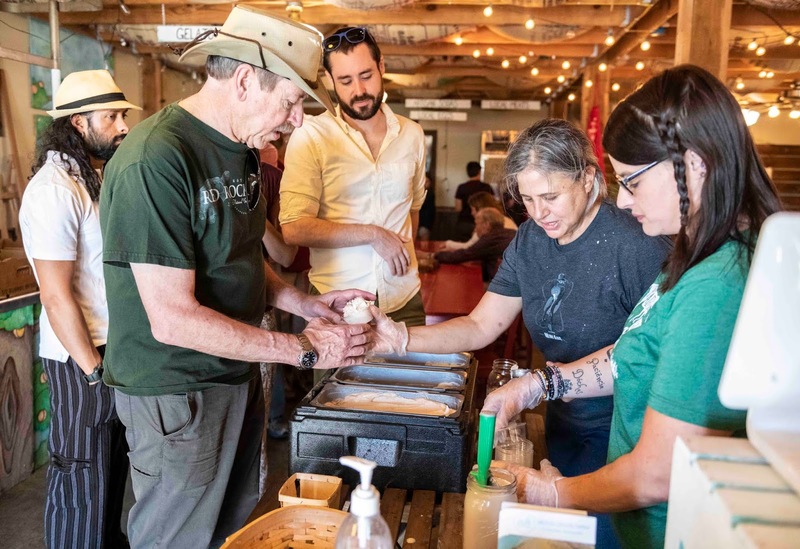 Between works, PFFC co-owner Wes Jarrell spoke about how he and Leslie began raising goats in 2004, which led to their interest in making cheese and eventually gelato. He also talked about their farm’s sustainability efforts. The short concert concluded with my String Quartet No. 3: Gaia. 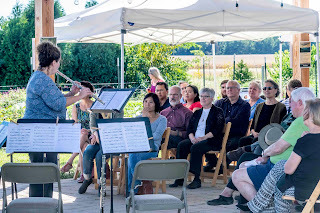 CUSO musicians Maria Arrua, Aaron Jacobs, Robin Kearton, and Barbara Hedlund performed movement 2 (Creation of Mother Earth) and movement 5 (…et in terra pax); maestro Matthew Sheppard conducted the quartet for this performance. We then took a break from music-making for about a half hour. Leslie served up more gelato while Wes brought out a goat to take pictures with musicians and guests. 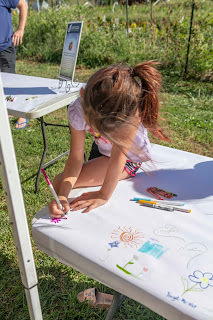 We had also set up tables for our ongoing “Messages to Gaia” art & poetry project, in which we invited our audiences to create artwork or write short messages/poetry inspired by our planet. Several audience members migrated over to the "Messages to Gaia" art tables to leave their contributions. I’ll write a blog post about the “Messages to Gaia” in November, sharing pictures of what our participants have left as messages to the planet. We gave another short chamber concert at 3:30 PM. The CUSO string musicians played movement 3 (Dance of the Earth) of my String Quartet No. 3: Gaia, and Amanda reprised her performance of Phoenix Rising. This was a wonderful way to wrap up a completely splendid afternoon of music-making on a goat farm! There is one more detail to mention – Executive Director Gerri Kirchner made beautiful posters featuring several of my earth-themed texts that I set to music in Terra Nostra, my oratorio. These posters included texts written by Walt Whitman, Edna St. Vincent Millay, and Percy Bysshe Shelley. 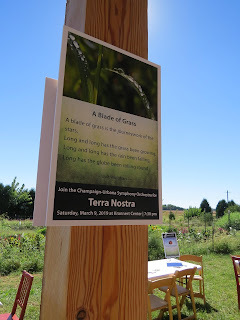 We attached the posters to several of the pavilion’s wooden posts, so people could read the poetry at their leisure. 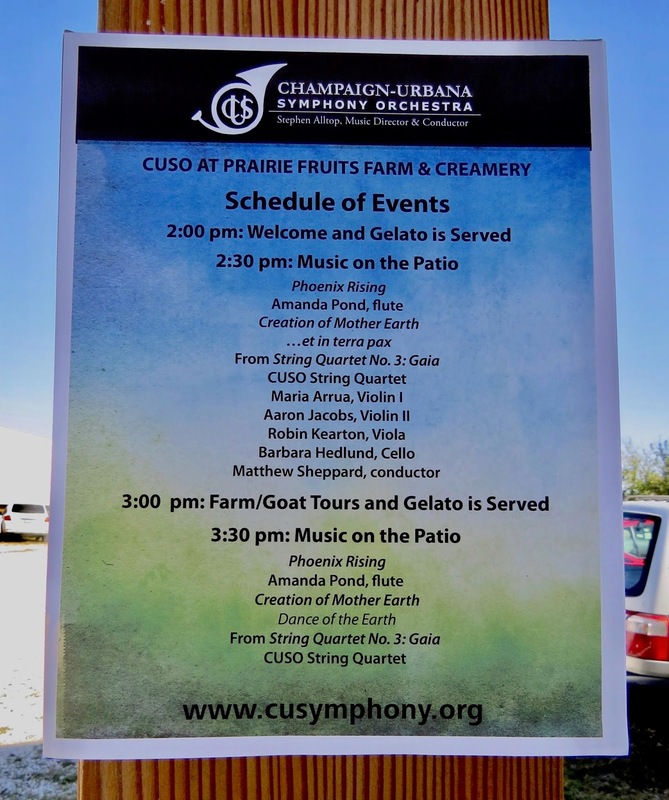 This was a very nice roll-out in getting people excited about CUSO’s upcoming March 9, 2019 performance of Terra Nostra at Krannert Center with the University of Illinois Oratorio Society, Central Illinois Children’s Chorus, and soloists. Thank you everyone who came out and spent this special afternoon with us! 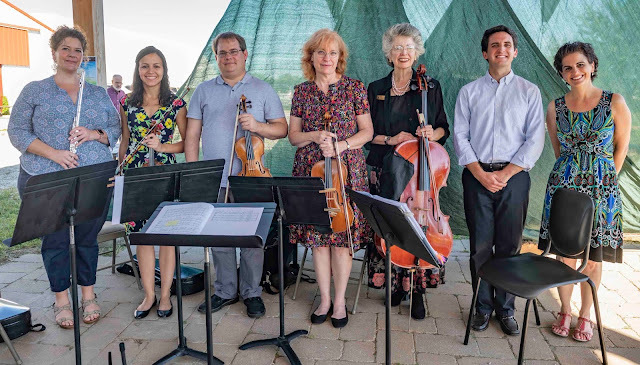 Thank you as well to Wes Jarrell, Leslie Cooperband, Gerri Kirchner, Alex McHattie, and the CUSO musicians for all of their work in making our event a wonderful success, as well as to our event photographer, Darrell Hoemann. 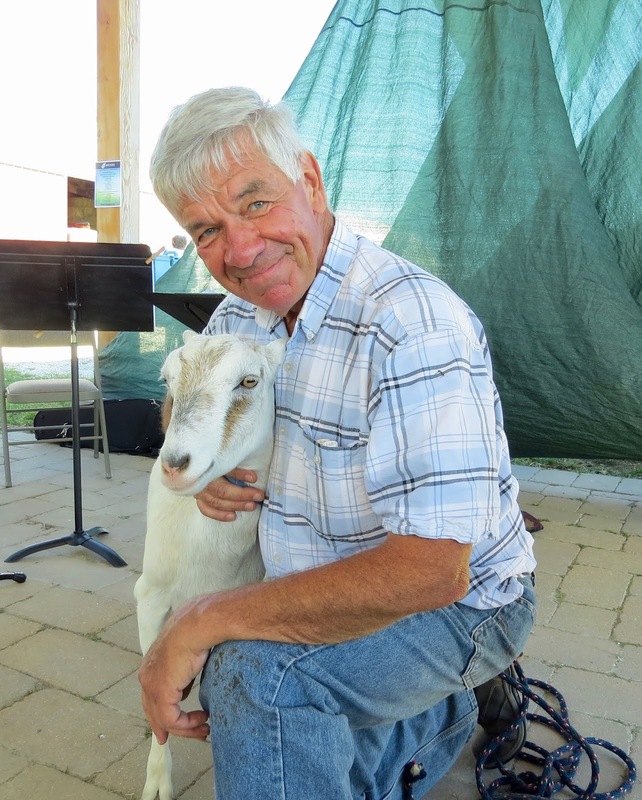 We hope you enjoyed the merging of music, gelato, and goats as much as we did! Enjoy a few more pictures from our event below.